Note: This post is being sponsored by YesVideo, but I would use their services (and have used them!) on my own dime because I have that much faith in their company. All thoughts and opinions (and app snapshots) are my own. A few months ago, my husband came home with a large box full of old Super 8 mm film reels. Most of them looked like the years had taken quite a toll on them. As much as HE was excited to see which childhood memories were hidden on those old film reels, I was possibly even more intrigued. I couldn’t wait to see a younger CandyMan, to see if my husband as a child reminded me of our kids. We already had a huge collection of videos from our family’s history, and I was so excited to add some of CandyMan’s earlier history to our video library. I was disappointed to not find very many shots of CandyMan in those reels after they were converted to digital video…but I laughed my head off when I saw some silly videos of my brother in law from sometime in the 80s. My kids could watch these video clips of their uncles (and all of those videos of the cats and dogs) and especially the videos of themselves over and over again. Who wouldn’t love to watch dancing like this? When we convert our old videos to digital format, we get DVDs that we can watch on the TV…but even better, we can watch our videos on my iPad with the YesVideo App (which just happened to get a brand new update this week!). The new app makes watching our old home videos fun and easy. We can pick up the iPad and watch a few clips whenever we’re in the mood for some entertainment. Video playback. You can watch all of the videos you’ve preserved with YesVideo (you’ll need an internet connection). Online sharing. Did you find an amazing video? Share your favorite scenes or entire videos via Facebook or Email. AirPlay compatible. Have Apple TV? You can play your preserved videos on your Apple TV wirelessly with AirPlay. New Snapshot feature Capture individual frames from videos, save them in the app, or create 4×4 Snapshots from a scene in your video (see the adorable 4×4 snapshot from a video of KitKat when she was 2 1/2). Save the images to your iPad, or share them on Instagram or Facebook (you know that’s what I’ll be doing!). The YesVideo iPhone/iPad app is available for free at the App Store. Click here to download the App today! To celebrate the launch of YesVideo’s new iPad app they are having a Twitter Party on Thursday, July 18th 8:00pm CT (plus on the blog they are giving away an iPad mini and $100 gift certificate to YesVideo for you to preserve your own home movies!!). Join the Twitter Party and share your favorite childhood memories, learn about the new iPad app and witness live shares of snapshots directly from the app itself! Plus they are giving away more fun prizes including an Apple TV. 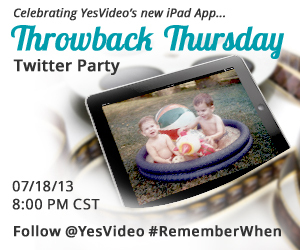 More details on the YesVideo blog and follow #RememberWhen to join in! Ready to transfer your old home movies? Get started today! How often do YOU watch old family movies? Do you have any from when you (or your spouse) was a kid?